Indian Sandstone Specialists Kilkea Stone Yard use the material in the decoration of many homes and gardens. 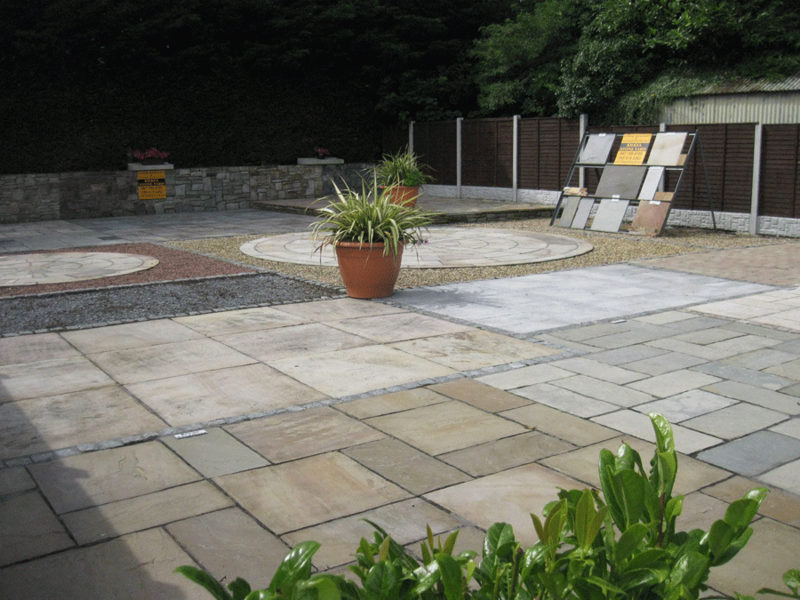 Kilkea Stone Yard will carry out your work to the highest standard and at very competitive prices. This specialist stone mason provides great value for money. Telephone 087 799 4790 to get your quotation now! Indian Sandstone is a classic sedimentary rock. It forms from the cementing together of vast numbers of sand sized grains to form a solid rock. Sand stone is a very stable product. It is one of the best suited natural stones for use on patios, paths and driveways. Sandstone is sometimes known as arenite. The grains are formed from minerals or rock. Most sandstone is composed of quartz and/or feldspar because these are the most common minerals in the Earth’s crust. Like sand, sandstone may be any colour. The most common colours are tan, brown, yellow, red, grey, pink, white and black. Sandstone beds often form highly visible cliffs and other features in the landscape. Certain colours of sandstone have over the years become strongly identified with certain areas and regions. Sandstone used in the building and gardening industries is mined by quarrying. Sometimes sandstone is found where there used to be small seas in the distant past. Sandstone is most usually formed in dry places or deserts. Examples are the Sahara Desert and the Arabian Desert. The Australian desert which includes the Sydney area. Most sandstone is red in central Australia and the western United States. to coordinate several different tradespeople. anywhere in the Leinster area. What is a Stone Mason? to create paving, patios or walls. granite window cills and granite steps. The job may require refurbishing the original cut granite. which needs to be restored. as well as Indian Sandstone Cobbles and Indian Sandstone Steps. 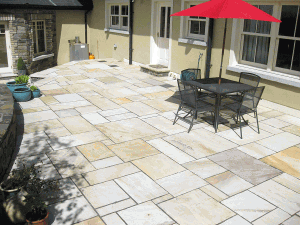 Kilkea Stone Yard are specialists in installing Indian sandstone.